Beautiful silkscreen,or serigraph, by Olive Fell. One of her wildflower series, this shows the blue hued Fringed Gentian against a green sky. Wonderful coloration and composition. 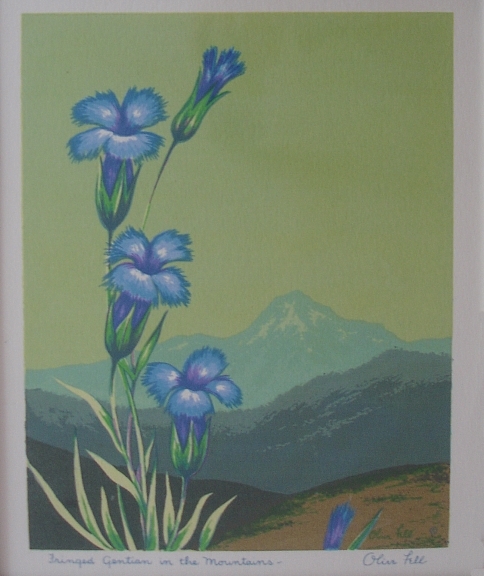 Titled "Fringed Gentian in the Mountains", and signed twice in the screen. Fell was an illustrator who created many Yellowstone Park images, and made all her own prints. She lived and worked in Cody, although she was originally from Montana.